Find Millions of Properties on the go with our Mobile App. 1 BHK / 520 Sq.ft. 4 BHK / 3856 Sq.ft. 1 BHK / 690 Sq.ft. 3 BHK / 1257 Sq.ft. 4 BHK / 1200 Sq.ft. 3 BHK / 2475 Sq.ft. 3 BHK / 1971 Sq.ft. 1 BHK / 800 Sq.ft. 1 BHK / 325 Sq.ft. 1 BHK / 1300 Sq.ft. 1 BHK / 666 Sq.ft. Welcome to RealEstateIndia.com. We have been serving the needs of the real estate industry in India since 2007. Our single platform is designed to meet the needs of buyers, sellers and brokers of India properties. Our success is attributed to our understanding of the needs of our customers and consistently working to meet those needs utilizing innovative e-commerce solutions. If you are interested in purchasing a home or locate a rental property, you can search India properties using our portal to find the right residential property or commercial property to fit your needs. 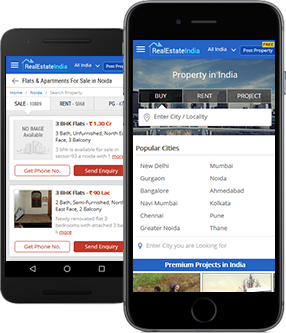 Search India properties in our enormous database by the type of property, the location and other attributes to quickly locate properties that meet your exact specifications. Do you have a commercial property or residential property to sell or rent? You can list your rental property or real estate on our website. Our real estate portal is structured to provide wider exposure, so your property will be seen by as many buyers as possible for a fast response to your listing. There is no charge for listing your property, just register with us and enter details and images of your property to get started.